Many doen't know this, but Toronto's professional wrestling scene is one of the best around. The city that we call home is no stranger to the pro wrestling. In fact, the history of this business in Toronto goes back generations, to the days of legendary grapplers like Lou Thesz, Bruno Sammartino, The Sheik, and Gene Kiniski. And as decades have passed and the industry has consistently changed and evolved, Toronto has remained a hotbed for homegrown talent, indie promotions and international events. One person who has seen this firsthand is Arda Ocal. Fans of WWE Raw (the flagship show of World Wrestling Entertainment, which airs every Monday night on The Score, are probably already familiar with Ocal. He hosts "Aftermath," a sort of post-game analysis for all things related to the WWE. On top of that, he has been a player in the local indie wrestling scene since 2005, bringing his presence and expertise to organizations such as Maximum Pro Wrestling and, most recently, Squared Circle Wrestling. The latter serves as a showcase for students of Squared Circle Training, Ontario's most prestigious wrestling school. This Saturday, Nov. 12, Squared Circle Wrestling will be holding an event at the Trio Sportsplex in Vaughan. Ocal will serve as the ring announcer for the night's action, which will see up-and-coming talent like Sebastian Suave, Anthony Fiasco, "Textbook" Tyson Dux, and RJ City take to the ring. The SCW may not be as big as WWE, but Ocal feels that its growth and success is just another reason why the pro wrestling scene in Toronto is nothing to sneeze at. "Simply put, wrestling fans in Toronto have, over generations, seen some classic matches and events," says Ocal. Ocal has had a passion for wrestling all his life, something which becomes clear when you chat with him about it. He has an almost-encyclopedic knowledge of the business, especially when it relates back to Toronto, and he truly believes that this city has played an important role in its evolution. "In the wrestling business, Madison Square Garden is the most prestigious venue of all time, but I'd argue that Maple Leaf Gardens isn't far behind," says Ocal. "Over the years, practically every major player in wrestling performed there. The Original Sheik, Lou Thesz, The Iron Sheik, "Rowdy" Roddy Piper, Hulk Hogan - legends of the industry." If you want an idea of how huge pro wrestling can be in Toronto, consider this: the WWE's single biggest annual show is Wrestlemania. Wrestlemania X-8, which was held at the Rogers Centre in 2002, attracted the largest paid crowd to the venue, with over 68,000 fans in attendance. The previous record was - surprise, surprise - Wrestlemania 6, which took place in 1990. Even more astonishing is the fact that, with all of the big names that have wrestled in the WWE over the years â legends like Hogan, Ric Flair, The Rock, and "Stone Cold" Steve Austin, just to name a few â the most decorated superstar in the history of the company is Edge. Born in Orangeville, his dream was to become a pro wrestler, and he trained in Toronto under wrestling greats Sweet Daddy Siki and Ron Hutchinson. When a severe neck injury forced him to retire earlier this year, he had held 31 championships in the WWE, more than any other superstar. "Edge is a great story. He won free training by submitting an essay, and became one of the greatest wrestlers of all time," says Ocal. "Years later, after he retired, he paid it forward, and picked who he thought wrote the best essay to receive free training at Squared Circle Training." In addition to Edge, names like Christian, Val Venis, Bobby Roode and Gail Kim have all been trained in and around Toronto, and each has achieved various degrees of success in the WWE and beyond. It remains to be seen whether or not any of the wrestlers from Squared Circle Wrestling become the next big thing in the WWE. If you're at the Trio Sportsplex on Saturday night, however, you'll get a close look at an industry with deep roots in Toronto that continues to thrive. Squared Circle Wrestling photos courtesy of Steve Argintaru. 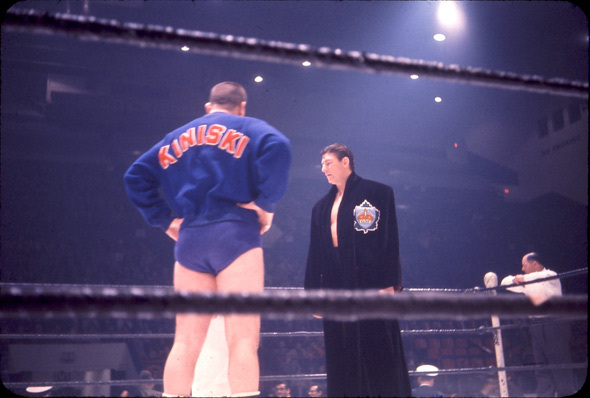 Maple Leaf Gardens wrestling bill and Kiniski vs. Layton photo courtesy of Roger Baker.